I've come across plenty of formulas to find blank cells within a certain specified range, but can't seem to figure this out / find an answer. 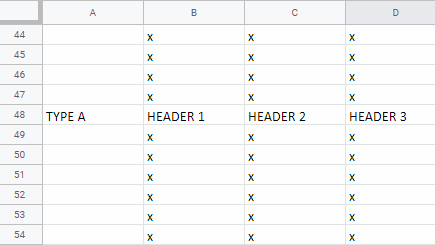 What I'm trying to do is have a formula that can find the row of the cell A header from within a section, but so that the formula will work in any section. So in the above "sheet", let's say I was in cell B52. Maybe there's a formula to look at A52, and if empty keep moving up until it found that cell A48 was the first cell upwards to have a value, and return the value as 48 (the row). I'm also hoping this can be done with regular formulas and avoid using g scripts if possible so it can remain dynamic. 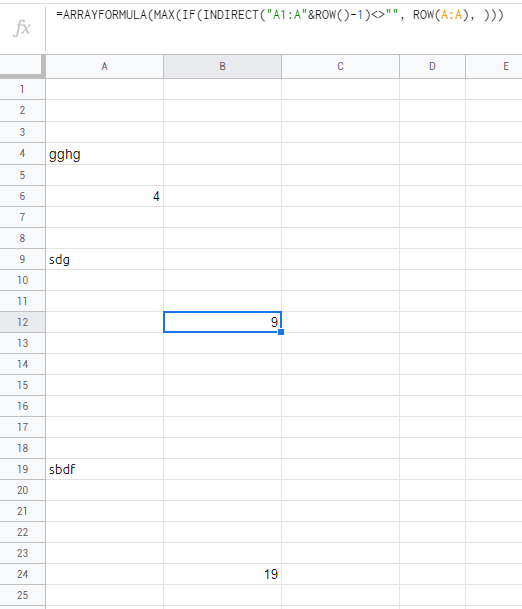 I'm hoping for a formula that when placed in cell B32 as highlighted, it will return A28, or just 28, as in the row of the previous non-blank cell, but then ideally, the same formula could then be placed anywhere else, say for example B46, which would then return A37 as the previous non-blank cell in the A column.